You know how there are some things that you don’t cook with or eat that often? It’s not that you dislike them, it’s just that you and that ingredient never seem to cross paths. For us, that ingredient is cherries. They occasionally end up in our fridge, but they’re not really one of our go-to fruits, especially when baking. Pitting a bunch of cherries is a pain! However, when we saw this Dutch baby recipe recently and noticed that we had some cherries on hand, we decided that we had to make it. 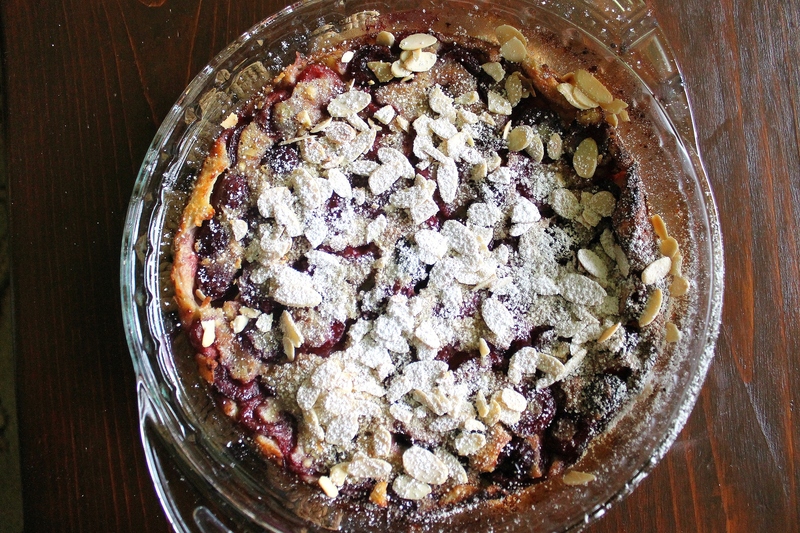 It might just end our no-baking-with-cherries streak that we unintentionally started. The pairing of cherries and almonds is a great one. It isn’t overly sweet, but a dusting of powdered sugar is all that the giant pancake needs after coming out of the oven. It is breakfast perfection- you should try it over the weekend! Heat oven to 425°F. Whisk together the eggs, sugar, flour, milk, almond extract and salt until the batter is evenly combined (it’s okay if the batter is lumpy). Melt the butter in a 12-inch ovenproof frying pan. Add the cherries and cook until warmed, which will take about 2 minutes. Pour the batter into the frying pan and bake for 15 to 20 minutes, until golden brown and puffed. Remove the Dutch baby from the oven and top with toasted almonds. Dust with powdered sugar and cut into slices. Enjoy! Note: We didn’t have an ovenproof skillet, so we cooked the cherries and butter in a small saucepan and then poured the mixture into a pie plate. It worked just as well!